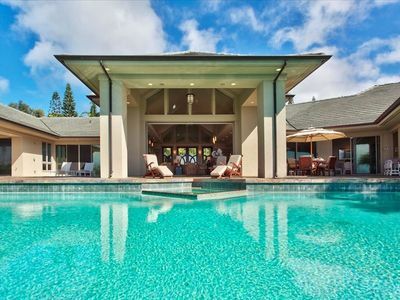 KAPALUA'S GATED LUXURY HOME IN the Kapalua resort, PLANTATION ESTATES LOCATED ON THE 18TH GREEN OF THE WORLD FAMOUS PLANTATION GOLF COURSE. (MAUI PERMIT # BBWM2009/0008) the only house in the Plantation Estate to have this permit. 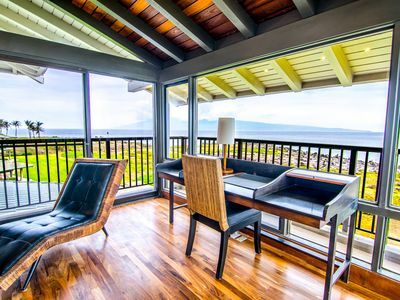 VILLA by the sea is the ultimate in Kapalua lifestyle. 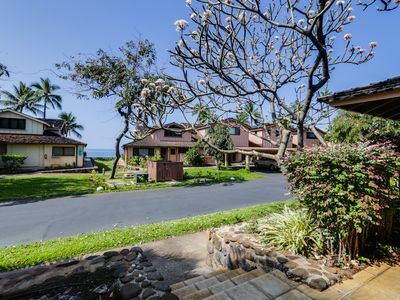 A stunning property with a mountain and/or ocean view from every room in the home. 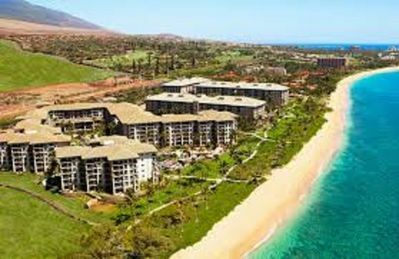 It is located above the 18th hole of the Kapalua Plantation Golf Course. 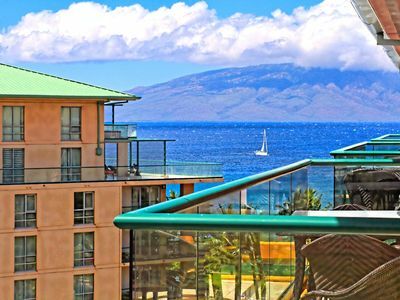 Every room at the VILLA by the sea has access to the outdoors. 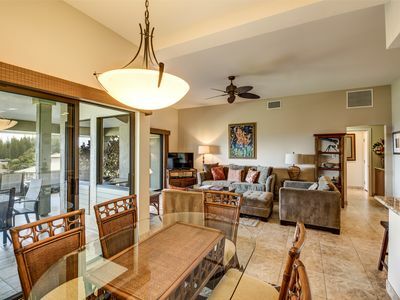 The hillside location provides a breathtaking and idyllic vantage point of the 18th green of the world-famous Plantation Golf Course and from the grand lanai, gaze over the Infinity edge pool to the crystal waters off D.T. 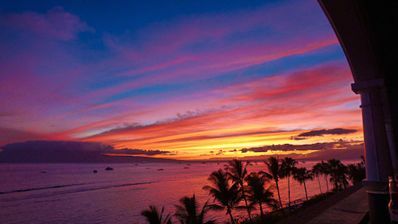 Fleming Beach and the Island of Moloka'i. Or just relax in the Jacuzzi and admire one of the best views in the world. As one steps into the foyer/entrance hall the tone is set by the exquisite artwork, and marble floors. Continuing into the Great Room, the living room features electronic entertainment choices: Sony 65” HDTV, DVD, CD, VCR, and a central stereo system that provides music in each room of the house with convenient sound controls. The gourmet kitchen offers two islands – one with a six burner gas cooktop, the other with a small sink, two dishwashers, a double sub-zero refrigerator, and other major and small appliances. Enjoy a simple meal in the kitchen nook or an elaborate meal at the formal dining table also located in the Great Room. 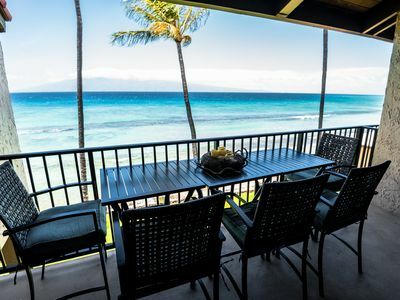 For an al fresco meal, bar-be-que outdoors or dine under covered area of the lanai. The décor is contemporary with tasteful appointments and artwork. All counter tops are granite, and the floors are marble throughout with the exception of the lush carpets in the four bedrooms. The open-flow design splits with three bedrooms in the North wing and the Master suite in the South Wing offering complete privacy. The VILLA is fully air conditioned and offers ceiling fans as well. All bedrooms have their own television set, en-suite bath and retractable blinds. There are two half-baths; one at the entrance to the North and South wings. The spacious Master bedroom offers one king size bed with 180 degree views of the sky, mountains and sea. 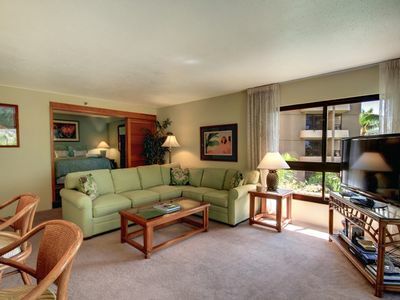 The double sliding doors offer easy access to the lanai, and warm Hawaii breezes. 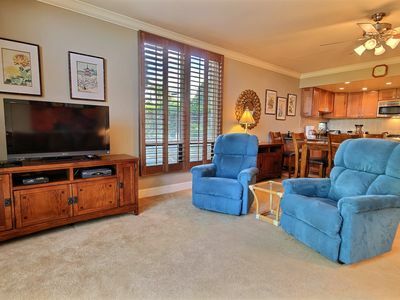 Besides the stereo music system, there is a 40” HDTV with surround sound, and walk-in closet. The oversize Master Bathroom includes a garden views through double-sided glass, dual sinks and vanities – his and hers -- a walk-in shower with marble tile, multi shower heads, enclosed with retractable doors which offer access to the surrounding private, tropical garden and outdoor shower. 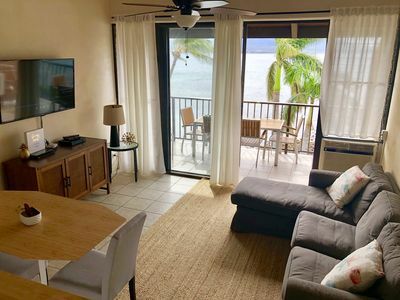 The Second Master Bedroom Suite offers a four-poster King size bed, private lanai access, ocean golf course and view of the Islands via two sliding glass doors. The bathroom has a six-foot sunken tub, shower and dual sinks. 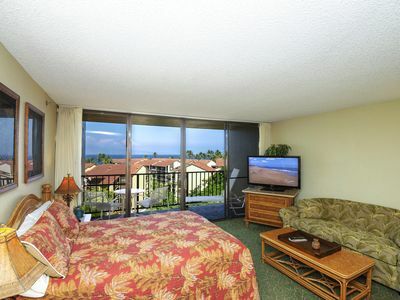 The third bedroom suite offers a King or two Twin size beds, ocean view and private lanai with patio furniture. This bathroom features a shower only. The fourth bedromm offers a King size bed also. 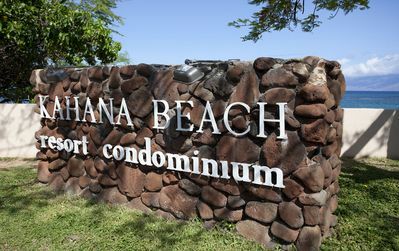 VILLA by the sea is located in a gated community with 24-hour security. Enjoy a meal at the Plantation Club House which is less than a five minute walk away. 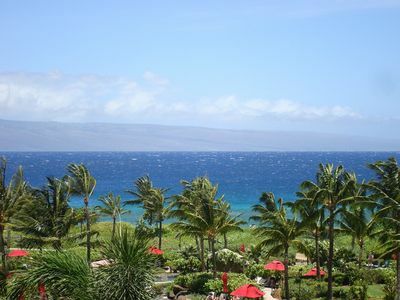 Kapalua is known for it's stunning mountain and ocean views scattered with Pine trees and tropical flowers. 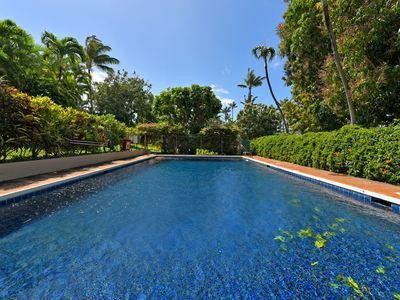 VILLA by the sea estate is 2 acres lined with papaya, banana, orange, grapefruit and Plumeria trees. All year round, enjoy fresh fruit and tropical flora. The first tournament of the PGA season is held on the Plantation Course where you have a front row seat to watch some of the sport’s best performers during the annual Hyundai Open in January. 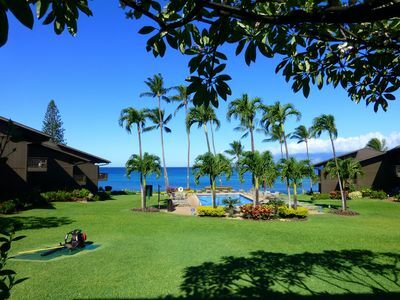 This and the nearby Bay Course is available for your golfing pleasure. 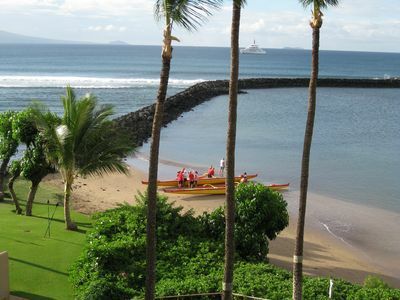 Don't forget the beach with three amazing sandy locations within a five minute drive. Avalon by the Sea is a spectacular property for its magnificent interior, breathtaking views, and relaxing privacy. 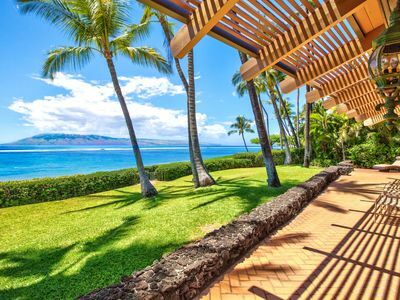 Kapalua Bay Villa Gold Ocean Front! 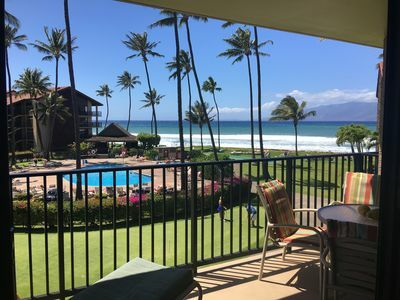 Gorgeous 2Br/2Ba Kapalua Golf Villa! 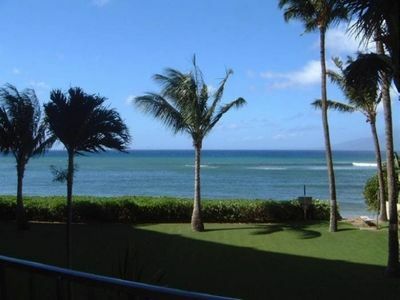 K B M Hawaii: Air Conditioned & Beach Front 5 Bedroom, FREE car! 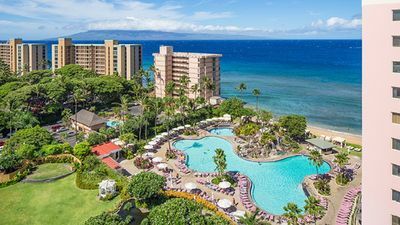 Jun & Jul Specials From only $1,429!